Untill today Nyköping has been having the status of “decent”. The list of cities in Sweden and their status can be found on the Wiki(WikiProject Sweden/Cities). After many hours of mapping yesterday, I changed the status to “completed”(for car navigation). The description of the completed status states “All public roads should be mapped. Roads should be tagged with name and driving restrictions should be fully mapped.”. I decided when I saw the status table at the wiki yesterday that the task for the weekend should be to make sure that Nyköping could be given the status completed. I saw it as a easy task as we have been spending a loot of time on mapping buildings downtown but I did knew that some roads was missing names so I used the “QA” tool to check for roads without names. I think I added about 70 missing names, much more then I had thought of. I also discovered that in the eastern part of Nyköping there was black areas where roads were missing. The areas had no aerial imagery. I went to sleep late that night, mapping about 30 new roads without aerial imagery. I think the result become as good as it can be anyway. 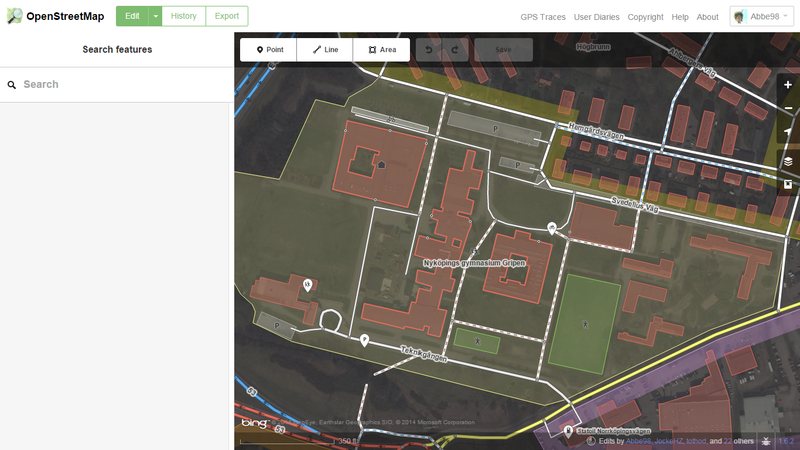 The next parse in mapping Nyköping are we still discussing(we means me and another year one student at Nyköpings Orienteering Gymnasium). We are working on a task list that we will maintain through Github(Pages+Mapbox+GeoJSON) so that everyone can see what we are working on and give us a helping hand.